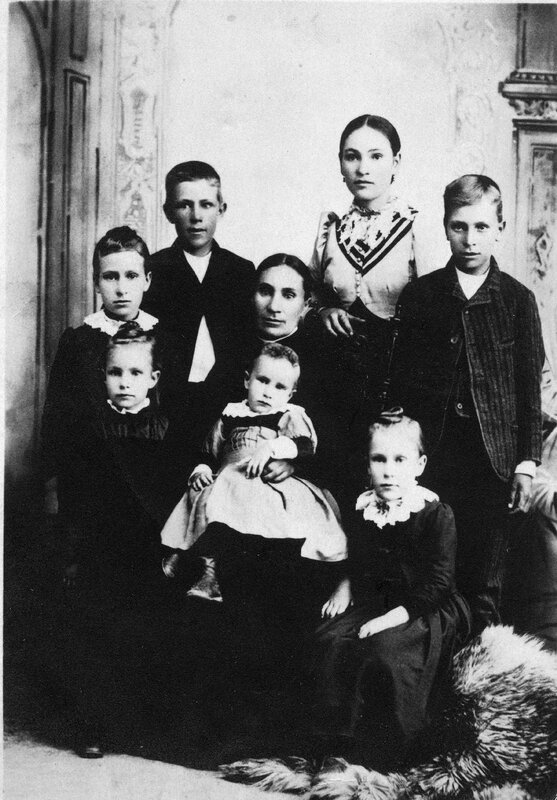 Photograph of Joanna Matilda (Erickson) Westover and Despain, including seven of her nine children. Photograph provided by Carole (Westover) Call. Additional information provided by Janet (Unknown). Additional Information: Joanna's first husband (Edwin Lycurgus Westover) made a pack with his best friend Henry Waters Despain - That when they colonized if either of them should die the living one would marry the dead man's wife and have kids, but the kids would be sealed to the man that died. That is why her last 7 children are surnamed Westover, and not Despain. The two youngest children are missing from this photograph. 1. Laura Matilda Westover, born February 09, 1875. 2. Edwin Swen Westover, born January 20, 1877. 3. John Lycurgus Westover, born October 04, 1880. 4. Mary Sophia Westover, born October 08, 1882. 5. Amelie Christina Westover, born June 29, 1885. 6. Electa Drucilla Westover, born October 08, 1887. 7. Emma Octava Westover, born October 12, 1889. 8. Albert Oscar Westover, born October 09, 1893. 9. Franz Henry Westover, born July 10, 1896. Back Row (Left to Right) - Edwin Swen Westover and Laura Matilda Westover. Middle Row (Left to Right) - Mary Sophia Westover, Joanna Matilda (Erickson) Westover / Despain, and John Lycurgus Westover. Front Row (Left to Right) - Electa Drucilla Westover, Emma Octava Westover, and Amelia Christena Westover.